Following is a description of available options for tuition and fee payment schedules. This is a legal contract and acknowledges your full responsibility for satisfying all financial obligations in a timely manner. 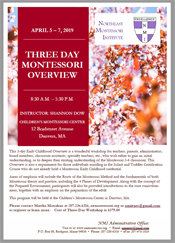 It is the belief of Northeast Montessori Institute that individuals wishing to undertake Montessori teacher training not be prevented from doing so due to financial restrictions. Northeast Montessori Institute is not, however, a lending institution and encourages applicants to seek alternative financing when available, as the meeting of its operating expenses are based upon the responsible, timely tuition payments of its Adult Learners. The payment plans include tuition of $5,000.00; and Association Membership and Intellectual Property Fees of $900.00; for a total of $5,900.00 (a $50 application fee is due separately at time of application). Should you withdraw before the start of classes, the association dues of $400 will be refundable; otherwise all other terms in the following plans apply. Arrangement for payment through third parties does not transfer responsibility for upholding the terms of this contract on the part of the enrolled individual. Association membership and intellectual property fees in the amount of nine hundred dollars ($900.00) are nonrefundable and are due on or before June 1. Full tuition of five thousand dollars ($5,000.00) is due on or before July 1. Initial payment of one thousand four hundred dollars ($1,400.00) is due on or before June 1. Association membership and intellectual property fees in the amount of nine hundred dollars ($900.00) are nonrefundable and will be deducted from this initial payment. The remaining balance is due in three (3) equal installments of one thousand five hundred five dollars ($1505.00) on or before July 1; October 1; and January 1. A service charge of $5 per payment is included in each payment. Initial payment of one thousand four hundred dollars ($1,400.00) is due on or before June 1. Association membership and intellectual property fees in the amount of nine hundred dollars ($900.00) are nonrefundable and will be deducted from this initial payment. The remaining balance is due in four (4) equal installments of one thousand one hundred and thirty dollars ($1130.00) on or before July 1; October 1, January 1; and March 1. A service charge of $5 per payment is included in each payment. Initial payment of one thousand four hundred dollars ($1,400.00) is due on or before June 1. Association membership and intellectual property fees in the amount of nine hundred dollars ($900.00) are nonrefundable and will be deducted from this initial payment. The remaining balance is due in eight (8) equal installments of five hundred sixty-seven dollars and fifty cents ($567.50) on or before the first of each month from October 1 through the following May 1. A service charge of $5 per payment is included in each payment. A fifteen dollar ($15.00) fee will be charged for all payments not received within fifteen (15) days of respective due dates, unless prior arrangements have been made with the Institute Director or the business office. A fifty dollar ($50.00) fee will be charged to the Adult Learner for each album that is submitted after the end of the Adult Learner’s internship phase. A one hundred dollar ($100.00) certification processing fee will be charged to the Adult Learner for completing the course after August 1st following the conclusion of the normal academic schedule, unless prior arrangements have been made directly with the Institute Director. A twenty dollar ($20.00) fee will be charged for all checks returned for insufficient funds. All accounts must be current at the time of each seminar, unless prior written consent is obtained directly from the Institute Director. Payment may be made by Cash, Check, Money Order, VISA, MASTER CARD or AMERICAN EXPRESS. Arrangements for credit card payments or other matters regarding accounts may be directed to the Business Manager, Ms. Bonnie Davis, either by phone: (207) 596-1359 or by e-mail at: northeast.businessoffice@gmail.com. No refund will be given after the November seminar. Notices of withdrawal must be made in writing to the Institute Director. In the event of early withdrawal or dismissal, refunds for prepaid tuition will be issued according to the above schedule within sixty (60) days of receipt of written notice of withdrawal or issuance of written notice of dismissal. 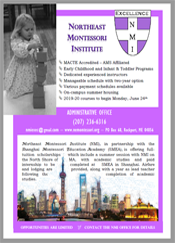 Northeast Montessori Institute will consider all interested individuals for admission. programs, and activities generally accorded or made available to Adult Learners in a school. affiliation in administration of its educational policies, admissions policies, or tuition programs.